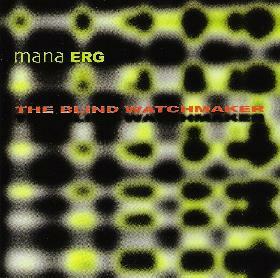 Mana ERG - "The Blind Watchmaker"
I very much welcome music that challenges the listener and this is certainly that kind of music. It is a mixture of a lot of different styles of stuff (think CLOCK DVA, Nine Inch Nails) but much more complex and interesting. While this is mainly the brainchild of Bruno De Angelis, he is joined by a lot of folks to pitch in a guitar here, a voice there, piano, synth, etc. It is sometimes dark, happy, bizarre, but always interesting and never boring. All the tracks have vocals except one but the deliver is quite different on each song. This is a CD you can play many times and always discover something new. If I were to go through all 9 tracks here I would probably write 2 pages. Yes... there is that much interesting stuff packed into each of these 5 minute songs! Pretty fantastic stuff. I look forward to hearing more from Mana ERG!